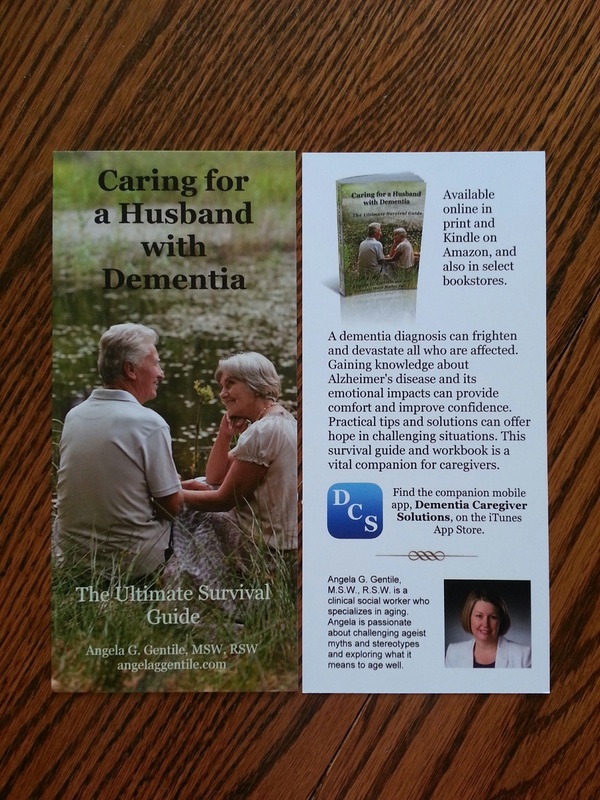 “Caring for a Husband With Dementia: The Ultimate Survival Guide” has been out for almost two months now. I have been to a few events since my book launch. 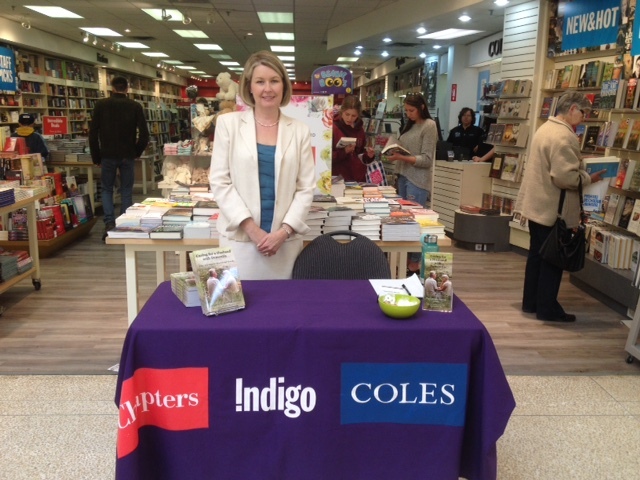 On Saturday, May 9, 2015, Coles – Kildonan Place (Winnipeg) hosted a book signing event for me. This is my second time doing an event like this, and I couldn’t find any “How To” on the subject. I’ve been learning as I go. I suited up; packed up my signing pen, rack cards, business cards and candy dish and headed over to Coles with a positive mindset. I was looking forward to the event, hoping to connect with lots of people. Since I only sold one book at my first event (and the author sharing a table with me that day sold two books) I hoped to sell one or two books at my second event. What I find most memorable from the event are the people who stoped by to chat. I appreciate when people open up and tell me their stories. My sister-in-law even stopped by on her lunch break to see me and I got her to take a picture (see above). A middle-aged man stopped by to say he wants to buy the book for his wife. I wasn’t sure if he was joking or not. But he went on to explain that he feels his chances of developing dementia are high because both of his parents had Alzheimer’s. He said his wife doesn’t want to talk about it. I encouraged him to take a rack card and wished him all the best. People seemed to enjoy the candies I was offering. Many children stopped by to take a caramel or a Lifesaver. It was interesting to hear the parents direct them to, “Say thank you.” Some asked for permission to take, others just dove right in. A younger couple told me about the man’s head injury from years ago and that he has been told he’ll most likely develop dementia when he gets older. He wanted his girlfriend to get the book so that when and if that time comes she’ll be well prepared. They were a sweet couple and she appears to be committed to the relationship and whatever may come down the road. A few people took my rack card. It’s a bigger version of a bookmark with information about me and my products including my mobile app for caregivers. One young woman said she couldn’t afford to buy the book ($19.95 CDN) but asked me to sign the rack card for her. I told her I am working on getting the book into the library but that it takes time. At the end of my two-hour event, a woman came to me with a smile, and told me I looked lonely. She went on to tell me about her experience of looking after her husband who had dementia. He eventually became quite aggressive and had to be moved to a nursing home. He died about a year ago. Now her neighbour is going through the same thing. She bought a book and asked me to sign it in memory of her late husband. She planned on sharing it with her neighbour or anyone else who may benefit from it. I ended up reaching my goal for sales. Selling two books in two hours doesn’t seem like a lot, but I was told that some authors don’t sell any books. It has been the bookstore’s experience sometimes the customers come back during the week to purchase the book. Some of them don’t buy when the author is there, but choose to come back at a different time. I have also read that sometimes a person needs to hear about, read about, or see a book seven times before they buy it. So, any exposure is good exposure. Angela G. Gentile, MSW, RSW is a clinical social worker who specializes in aging. She has helped hundreds of people who are struggling with the challenges aging can bring. Angela is passionate about challenging ageist myths and stereotypes and exploring what it means to age well. She considers herself a realistic optimist but she still can’t tell her left from her right. Find out more at http://www.angelaggentile.com.